I think this is just beautiful. What a lovely place to look at and to sit in. I soon realised it is the flowers which are "miniature" ... not the eventual size of the rose bushes ! Lol. there lovely ............ they look like my little ramberla ........ thats its name by the way . Lovely to have roses that evoke memories. Lovely photo TT, your garden looks beautiful as always. Looks a lovely peaceful spot, Terra. Is the rose scented? The roses have no scent at all ..
Gorgeous. I think Mum would be thrilled! ... and startled at the large plants grown from her "miniatures" Lol. Hi Cristina ... I looked up rose "Little Rambler" and that has scent, but my roses have no perfume, so probably not that variety ? A quick guess TT it could be American Pillar but it is a long way away and it could be a semi double. Maybe I'll take a close-up pic this week and put on GoY as a question for identification. How lovely, your garden looks really inviteing TT, well done! It looks beautiful your garden and thoses roses are flourishing wonderfully. How nice that they were your Mother's roses. I have a few plants that were cuttings from plants in the garden I grew up in..so many fond memories still there when I look at them. Your welcome Terratoonie looks a lovely place to sit and rest too with those roses surrounding too. They're lovely TT. It's nice to have plants to remember people by. Lovely picture and Mum's roses looking very pretty too from what I can see they are not unlike Dorothy Perkins but she has perfume doesn't she? Those roses look really lovely, TT! :-)) The rest of your garden is equally stunning! I didn't have a design plan for the whole garden .. Your gardens are beautiful Tt, they always look so neat and tidy and never seems to be a dead head anywhere on your photos. ..They are a credit to you! Your mums roses look lovely she'd be thrilled to bits if she knew how well you have looked after them. This photo has gone onto my favs.! Thank you Smilerjane for such lovely comments. I built my garden just a bit at a time, which is a fun way to do it. Gardens are changing and evolving all the while, and, yes... not easy when you have other demands on your time, but sounds like you and your youngsters love your garden and enjoy being out there. Sorry, I'm answering comments in the wrong order ! they do better every summer .. Your welcome Tt. Thanks for your PM. Please dont worry about not answering in order. Your photo reminds me of a few of my jigsaw puzzle pictures.....Its beautiful! I know what you mean about a jigsaw. Sometimes photos of woodlands remind me of jigsaw pictures ! This really is a beautiful picture TT, I love your roses. I'll be posting a pic of my largest sausage tree seedling soon. You won't believe how big it's gotten in the very hot and humid weather we've been having here in San Diego. The garden looks really good and the roses are blooming lovely. We had a similar rose at the other house but it died. I have just planted a very light pink one of similar ilk. What a fantastic array of colour, excellent. What a picture your garden is TT. 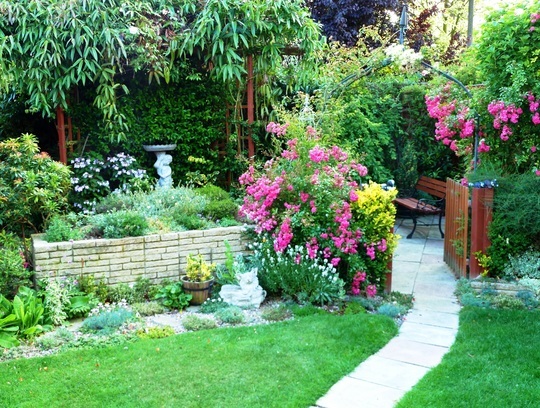 photo's, what a beautiful garden you have, it's just the sort of garden i would love to own. well done, lol, smurf. Your garden is beautiful and lots of lovely colours.